Last week's post featured my first ever shoot out in "the real world" (aka: beyond my front porch.) Since I'm still working solo and without a remote, the photography process is tricky enough in my own home. Today, however, I encountered a whole new speedbump on my quest for natural light. I wouldn't call myself a "people person." I can talk with friends for hours and hours over coffee, but making small chat with strangers is right up there with vacuuming as one of my least favorite pastimes. Unfortunately for me, when people see someone setting up a tripod on their sidewalk, then racing around to the other side of the camera to pose, they tend to get curious. Then they tend to do one of three things: a) ask what you're taking pictures of or (bizarrely) if you're taking pictures of them; b) comment to their friend: "She's taking pictures. "; or c) say nothing and just stare at you. ?!?! It's nerve-wracking enough taking public selfies (not to mention leaving a pricey camera unattended in the meantime), but enduring this additional scrutiny while trying to focus on the task at hand makes me flustered and generally annoyed at all people, regardless of their best intentions. How interesting I should feel this way when the very art of self photography is rooted in a desire to be viewed/studied/noticed by others. “Don’t look at me while I take a picture of myself.” -- The phrase could almost be considered paradoxical. The difference, I suppose, is that we wish it to be through the direction of our own lens. With summer right around the corner, it will soon be time to pack up to my transition pieces and bid them farewell until autumn. 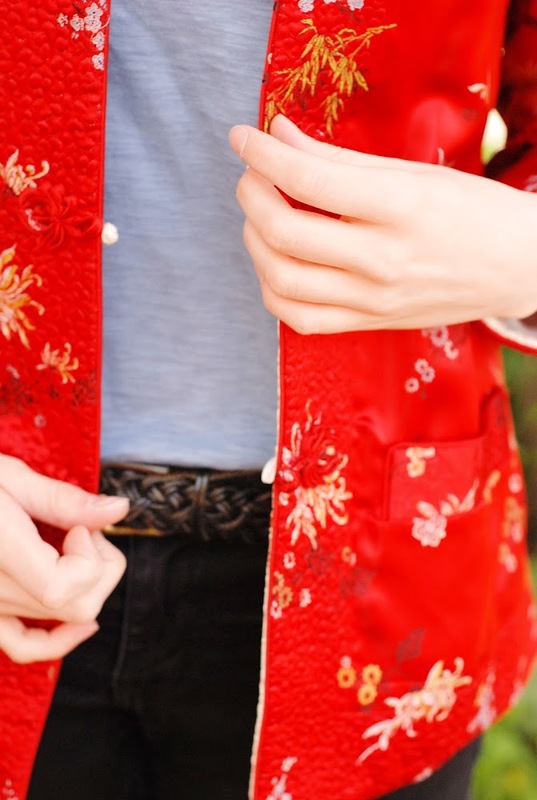 This silk Chinese jacket has been my go-to statement piece since I thrifted it last Christmas. The black skinny jeans are a favorite year-round staple, but I'll be swapping them for some lighter bottoms come July. Likewise, the leather boots will quickly make way for sandals & sneakers. I also wanted to get one last shot of my freakishly long hair before I update with a summer cut. I think I finally have enough to donate to Locks for Love (or a similar organization), and I can't wait to try out my Remington hot rollers on shorter curls! Bittersweet goodbyes aside, spring has already brought some much needed color to my wardrobe. I've gone totally batty for the hyacinth shade of this lace-trimmed tee! Never would I have thought to pair it with such a bright, firetruck red, but the two ended up hanging side-by-side in my closet, just begging to be paired. As it happens, the same shade of blue runs right through part of the jacket embroidery. Surprises like this make fashion an ever-engaging puzzle for me. I just love the challenge of bringing it all together! Boots: Betsey Johnson - "Natasha"